A Lab, the Amsterdam hub for new media and technology startups is introducing a new concept – the ‘Coffee Copter’. It is a quad copter programmed to serve coffee orders on different floors within the A Lab building. Through an integrated app, consumers within A Lab can order the coffee at the A lab coffee corner ‘The Coffee Virus’, where it is freshly prepared and then delivered to the offices in the building by the Coffee Copter. This way, the standard bartending is no longer needed. At the same time, ordering from a distance during work and meetings is made possible. The ‘Coffee Copter’ works through a smartphone app that anyone can easily download. This way anyone can order a coffee without leaving their desk. With every order, whether it’s an ‘Americano’, ‘Espresso’, ‘Cappuccino’ or ‘Latte’, the app sends a signal with the order to the coffee bar on the ground floor. Then the coffee corner employees prepare the coffee and set the cup to the Coffee Copter. The copter works with a stabilizer to keep the coffee as straight as possible during the flight. It also uses object recognition and movement detection to avoid people and objects. The drone is programmed with a 3D algorithm to fly routes through the building. The Coffee Copter will land at the delivery address on its specially designed landing pillar and signal the coffee is ready to drink. The Coffee Copter is a result of a collaboration between several disciplines within A Lab. A Lab wants to promote crossovers between different disciplines and this project is a good example. The creatives from ‘Instability We Trust’ worked on the concept, the digital agency ‘Unc Inc’ took care of the design, branding & development of the app, 3D-mapping and the routing through the building, while the video agency ‘Screenturner’ put the concept together in a film. 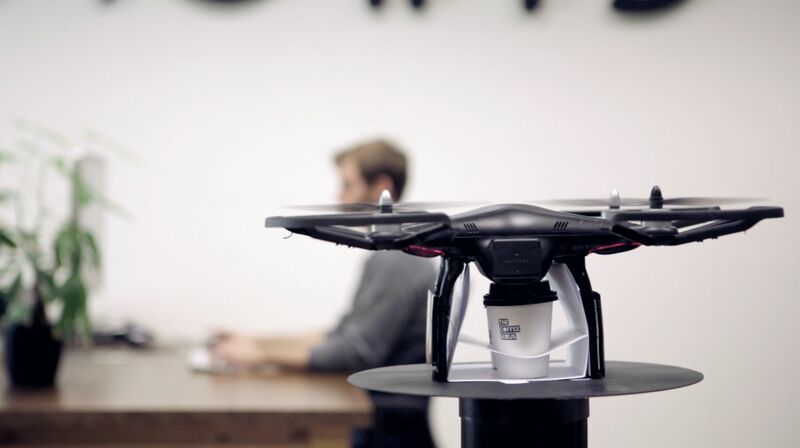 The actual Coffee Copter, cup holder and drone hardware was developed by ‘Puurontwerp & Skeyework’ and ‘The Coffee Virus’ was responsible for the customer experience and presentation of the coffee. This collaboration is a result of the passion and constant drive for innovation. The newest discoveries and innovations are created by constant collaboration between the sometimes less obvious disciplines that lead to a more practical use. The Coffee Copter has flown its first test flight and proved it’s possible for a drone to serve coffee to an office desk in the near future. At present time the drone is being further developed for the commercial market. The project is now seeking investors to develop the Coffee Copter even further.